It is amazing what happens when a few creative people get together to brainstorm ideas. 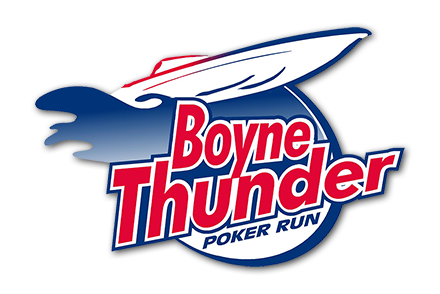 That was the case in 2004 with Boyne Thunder, when a small and dedicated group of Boyne City residents developed the idea for the event. The group’s purpose was to create a fund-raising event to help support the activities of the Boyne City Main Street Program, a new economic development program for the community. Main Street’s goal was to make Boyne City’s downtown a more vibrant place and to help preserve its historic character while encouraging development of a diverse and stable business atmosphere. From the beginning, Boyne Thunder partnered with Camp Quality, a non-profit organization that provides camping experience and year-round support programs for children with cancer and their families. Another early partner was the Boyne City Yacht Club. Recently Challenge Mountain was added as a beneficiary. A non-profit organization dedicated to enriching and improving lives for the mentally and physically challenged through outdoor recreation became a partner of the event. Today, the event draws 120 participant boats, 550 active participants from across the country, and thousands of spectators on boats and on shore who come to enjoy all that northern Michigan has to offer throughout the 150 mile course.